Roast garlic in oven until golden brown (about 30 minutes @ 300 in a small clay roaster), let cool, dice very fine. Using only the best quality, fresh ground chuck (I get a chuck roast and have them grind it, that way you know it’s all chuck), make 4 loose 10oz balls, next incorporate a clove of the finely diced roasted garlic and form into UN-uniform patties 1/2-3/4″ thick. 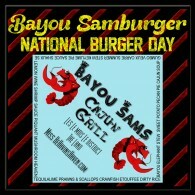 Sprinkle or coat to taste with Limon Salt, garlic pepper and Bayou Sam’s Triple Blast! Coat onion slices lightly with olive oil and place on medium to high heat grill. After you’ve seared each side well, place beef patties on grill and place onion on top of patty. Keep on patty until just before topping patty with either or both cheeses. Discard or save onion, you’re choice. Don’t cook patties over medium well. If you’re lucky (or trashy) enough to still have a coffee can of grease on your stove, coat both sides of the Hawaiian Rolls and toast on a flat griddle or the grill. 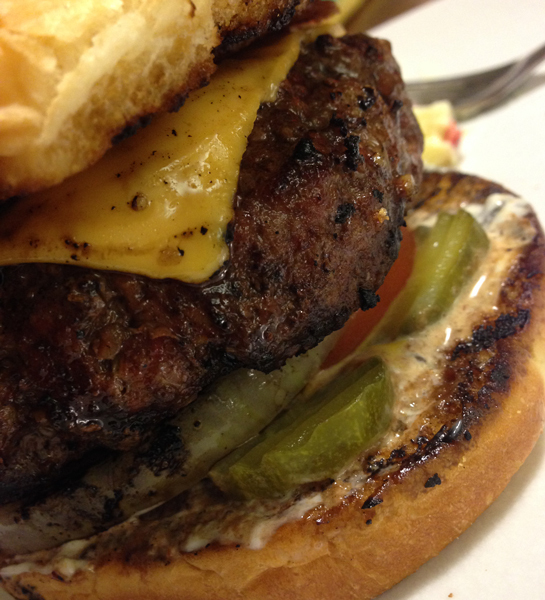 Build your burger with your favorite condiments. These listed are some of mine. Enjoy the summer while you can.